Bruises don’t work the same as scars. Scars are permanent marks, often with an interesting backstory. Whether your scars came from a medical procedure or bad decision, there’s something about a scar that is vaguely cool – even if it did come from punching through a wall. However, when it comes to a bruises don’t have the same exciting meaning. For some reason, bruises cause more anxiety without being nearly as awesome as scars. Bruises come in many shapes and colors. 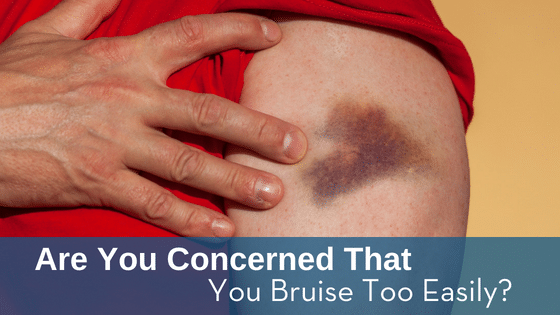 New bruises may be beautifully black and blue, while older bruises can be red, green, or yellow. A bruise occurs when blood vessels beneath the skin are damaged. This can happen when you bump into something or get play too hard. Bruises are common among people whose skin is more fragile, like kids and the elderly. These marks can also be a sign that something in your body is not working as it should, especially if the spots appear without knowing why or after you have barely been touched. Low iron, or anemia, may cause bruising. Being anemic means you have low amounts of red blood cells. An iron test or general blood test can determine your body’s iron levels. Frequent exercise is great and we don’t want you to stop! However, understand that frequent exercise may cause muscle tears and cause gnarly bruises. Some medications are blood thinners, like aspirin, prednisone, and prednisolone, which causes you to bruise easier. This blogger believes that ITP may cause bruising. This autoimmune disease involves low platelet counts and can be linked to a gluten allergy or sensitivity. Test Smartly Labs’ blood test can determine if you have ITP. Easily bruising can be one of the many symptoms of diabetes. You shouldn’t assume you have diabetes if you find a random bruise, but it is a possibility to consider if bruises become a pattern. If you notice other symptoms or ailments, consider getting tested for diabetes or talking with a physician to determine a diagnosis. Next ArticleDo You Need an STD Test? Previous ArticleWhy Self-Directed Health Testing?